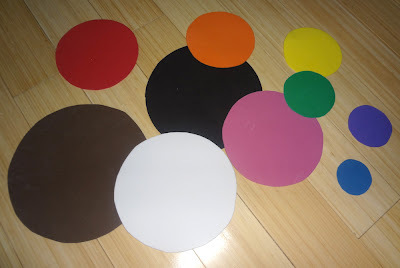 Cut ten circles from different colors of craft foam. Circle templates for this activity can be downloaded here. 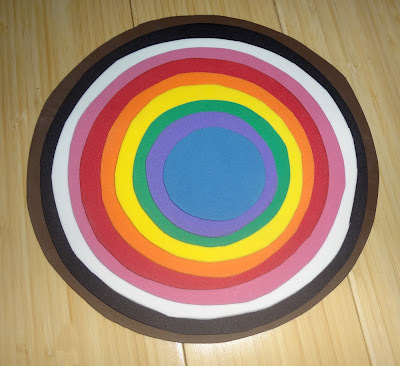 These circles can be used in a variety of fun ways that will also help your child learn. Have the child county how many circles there are. Take away one circle and have the child figure out which one is missing. Teaching colors: "please give me the red circle." or "put the red circle on the couch and hand me the green circle." I gave a set to my 15 month old niece and she found her own fun with them. She stood by a door inside the house and took every circle and shoved them under the door. It was so much fun for her (until they were ALL under the door and she cried for me to open the door and get them back out). Then of course she started the game all over again. 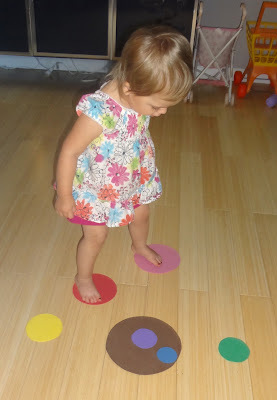 Jillian, almost age 2, uses the circles as skates. She also likes to make pizzas out of them by taking a big circle and putting the little circles on top of it. She's also able to hand me the color circle I ask for. We have not yet started talking about big vs. small.